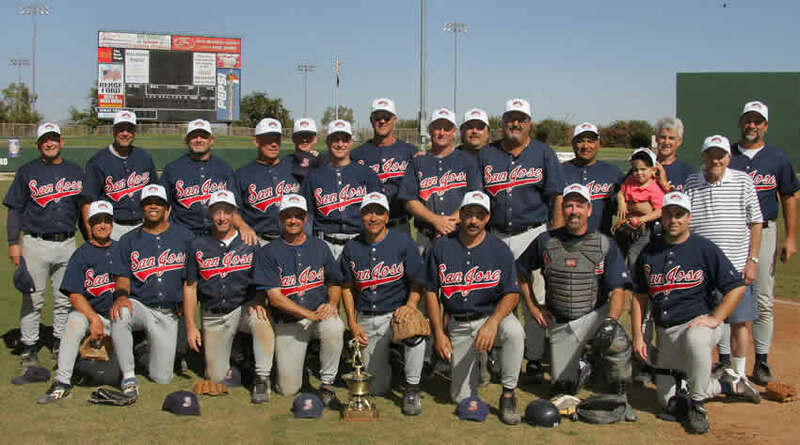 PHOENIX, Arizona -- The San José All-Stars defeated Sacramento 14-5 on Saturday to claim the 45+ MSBL World Series National Championship. John Yandle earned the victory with 8 2/3 innings of almost scoreless relief - allowing only an unearned run in the 3rd inning to earn his second victory in two days in the playoffs. John pitched 7 innings of 5-hit relief and did not allow an earned run to pitch San José to a 6-5 11 inning win over Kansas City in the semi-finals on Friday. In two days Yandle pitched 15 2/3 innings and did not allow an earned run! San José spotted Sacramento 4 runs in the top of the first as Craig Jones did not get any breaks starting the ball game. In the bottom of the first, San José answered with 6 runs of its own to take back control of the game. San José scored single runs in the 3rd, 4th, 5th, 6th and 7th innings, then tacked on 3 more runs to complete an offensive performance that featured 24 hits! Sacramento only held San José scoreless in the second inning! Lorin Grow went 4-4 with a walk to lead the San José attack. Mike Denevi, Don Sanford and Dave Meier all had three hits to pace the San José attack. For Denevi, who injured his calf in the second game of the tournament on Monday, it was a remarkable two day playoff run - he went 3-4 on Friday (including the walk off game winning double) and 3-3 in the championship game. For the week Mike was 9-11 - on one good leg! Dave Meier (11-23) and Cliff Hall (7-19) had 2 RBI doubles in the first inning to erase the 4-0 deficit and give San José a lead it never relinquished. Ron Dunn led the San José offense for the week, with the ex-major leaguer going 15-25 (.600) on the week. Lorin Grow, also an ex-big leaguer, was close behind with a 13-26 (.500) effort. Greg McNutt hit .407 on the week and was the defensive anchor for the team playing every game at shortstop while only committing one fielding error! Greg made several highlight film plays to thwart opposition rallies throughout the week. Dave Meier led the team with 10 RBIs and Robbie McClellan swiped 5 stolen bases. Other regulars who contributed to the championship run were Don Sanford (10-30), Billy Malpas (8-23), Robbie McClellan (5-15), Bobby Mendiola (8-2), John McMurtry (4-13), and Joe Zagarino (4-15). San José's depth was a key factor in the championship run and provided manager Mike Zamba with plenty of options to rest players during the week long tournament. Super subs included Pete Passantino (4-9), Dave Marquez (4-8), Dave Fredrickson (4-7), Buck Sharp (2-7) and John Gambello (2-6). San José completed the event with a 7-1 record in which they hit .387 as a team and posted a 2.89 team ERA. Catcher Murray Brown handled four of the seven games behind the dish including both playoff games and was the main reason San José pitchers enjoyed such dominating success - including 4 complete game performances. John Yandle had three wins to lead the pitchers while Sean Kelley, John McMurtry, Jay Loughran and Craig Jones posted victories during the week. John Hadley, who pitched 25 innings in four days during the Father-Son tourney the previous week, had a save out of the bullpen to help out plus started the semi-final playoff game. The National Championship is the San José MSBL's ninth in the 18-year history of the event and the 16th time the league has appeared in a Division Championship Game! Over 300 teams competed in this year's World Series event - making the MSBL event the largest amateur baseball tournament in the world! Competition is staged in the following age groups: 18+, Father-Son, 28+, 38+, 45+, 55+ and 65+ age groups.